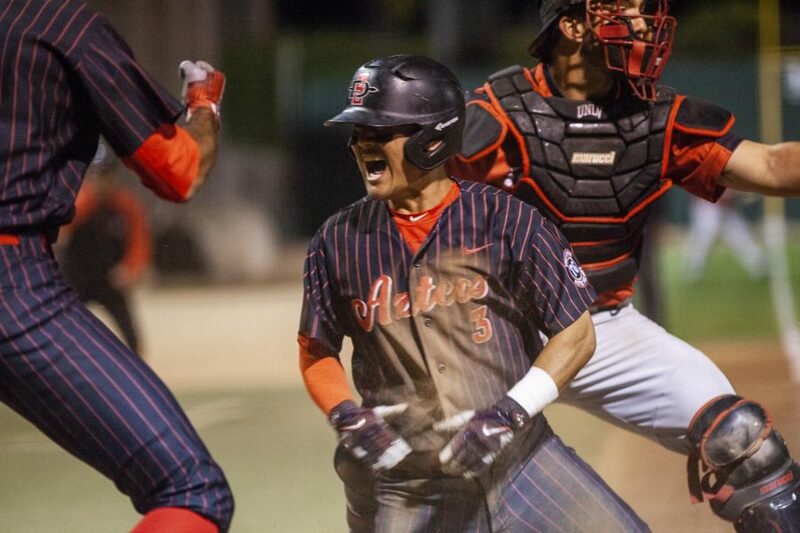 Sophomore second baseman Jacob Maekawa celebrates after scoring the game-winning run during the Aztecs 4-3 victory over UNLV on May 25 at Tony Gwynn Stadium. 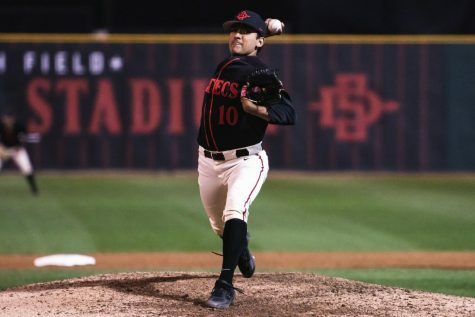 San Diego State baseball found itself in another nail-biter in the Mountain West Championship tournament on Friday night at Tony Gwynn Stadium. One day after grinding out a come-from-behind 2-1 victory over No. 3 San Jose State in the tournament’s opening round, the No. 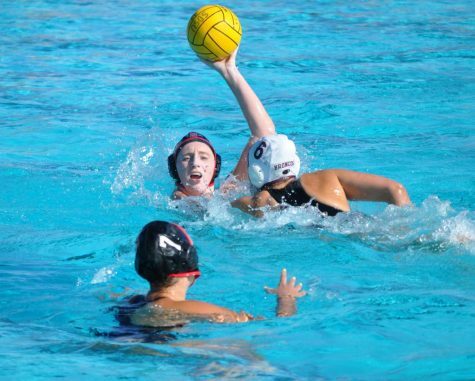 2 Aztecs entered the twelfth inning gridlocked in a 3-3 tie against No. 4 University of Nevada, Las Vegas. With a direct trip to the championship final on the line, the stakes were high and both teams were going on nine innings without a run. 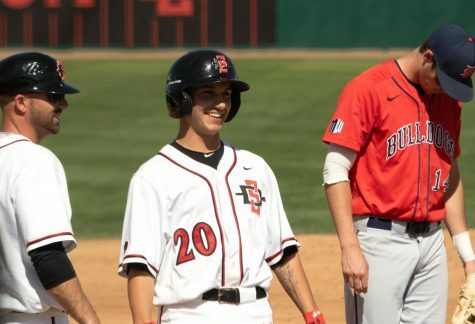 SDSU loaded the bases with one out in the bottom of the frame, and after a flyout to left field by junior first baseman Jordan Verdon, sophomore second baseman Jacob Maekawa slid in safe to home plate to score the game-winning run and send the Aztecs to the championship game with a 4-3 victory. 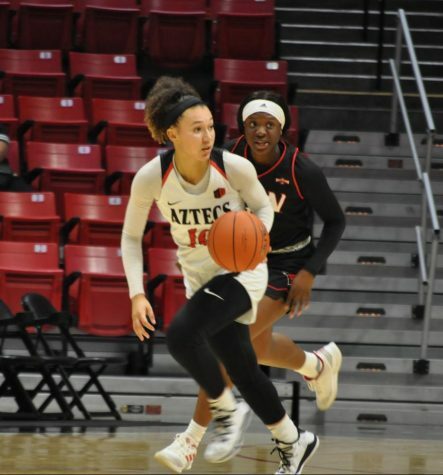 “The one thing I’ll tell you is, true to form, the Aztecs do it the hard way,” head coach Mark Martinez said. 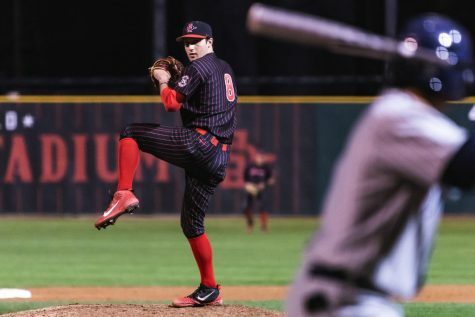 The inning began with Maekawa getting hit by a pitch from UNLV senior pitcher Bryan Menendez, the third time in four innings the Aztecs got the lead-off man on base. Freshman outfielder Matt Rudick singled to get Maekawa to second, before an errant pick-off throw from Menendez went into center field, sending Maekawa to third and Rudick to second. Following a groundout to third by senior shortstop David Hensley and intentional walk to senior outfielder Chase Calabuig, Verdon stepped to the plate and smacked a 3-1 pitch to shallow left field. The ball actually beat Maekawa to the plate, but the second baseman put his head down and slid safely just under the tag of Rebels junior catcher Seth Mullis. SDSU will now await the winner of UNLV and SJSU tomorrow, who play earlier in the day before the championship game in the evening. Undefeated in the tournament, the Aztecs will have a chance to wrap up the championship on Sunday if they do not win tomorrow’s game. Aztecs junior starting pitcher Harrison Pyatt went 4.2 innings pitched, giving up three runs on six hits with four strikeouts. 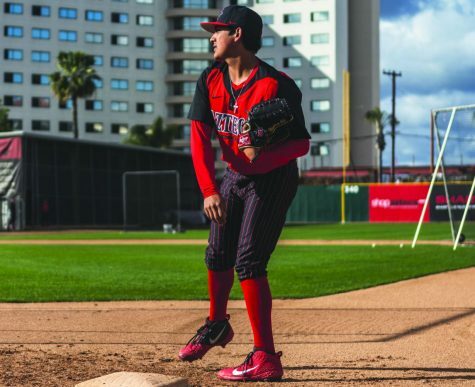 Sophomore pitchers Adrian Mardueno and Logan Boyer pitched a combined 4.1 innings of hitless relief for SDSU, before freshman pitcher Casey Schmitt came on in the tenth inning and was awarded the first win of his career after pitching three innings, allowing one hit and striking out three. 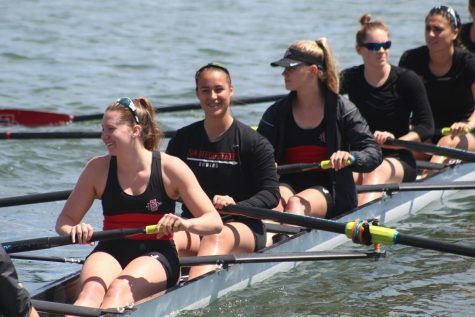 “I was feeling really good, I could probably go on a lot longer,” Schmitt said. Martinez praised his young freshman, who has now gone 25.2 innings without allowing a run and lowered his season ERA to 0.28. UNLV did all of its damage in a three run third inning which featured four hits and saw RBI’s from junior third baseman Dillon Johnson, senior second baseman Nick Rodriguez and junior first baseman Nick Ames. SDSU withstood a four-hit performance from Johnson, who finished with three singles, a double and one run scored. The Aztecs responded in the bottom of the third, scoring three runs off five singles and getting RBI’s from Hensley, Verdon and redshirt junior designated hitter Chad Bible. Junior starting pitcher Trevor Horn pitched eight strong innings for the Rebels, allowing three earned runs on nine hits with two strikeouts. 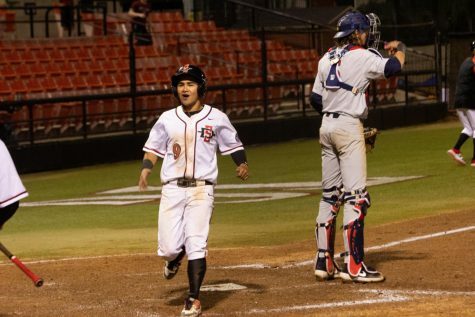 The Aztecs had a chance to win the game in the bottom of the ninth inning, but left pinch runner Denz’l Chapman stranded 90-feet from home plate after a groundout by Rudick.